to produce a fine powder. Rinse the halloumi under cold water for a few minutes to remove some of the salt, then pat dry thoroughly with kitchen paper. 2. Finely grate all the cheeses on a box grater, then mix together in a large bowl with the semolina (or plain flour), baking powder, sugar, mint, sultanas and 1⁄2 the spice powder. Make a well in the middle of the cheese mixture and gradually add the beaten egg, mixing with your hands until you have a rough ball; it should be moist but not too wet. Mark the symbol of a cross into the mixture with your hand and cover with cling film; set aside for 30 minutes. a pinch of salt into a large bowl. Rub in the butter with your fingertips until evenly combined, mix in the oil and make a well in the centre. Warm the milk, sugar and 60ml water in a small pan, then gradually mix into the dry ingredients until you have a soft, smooth dough (you may not need all the liquid). Knead in the bowl for a few minutes, then mark the symbol of a cross in the mixture, as you did with the filling. Cover with cling film and leave to rest for 10 minutes.
. Preheat the oven to 200 ̊C, gas mark 6; line two large baking trays with baking parchment. Divide the pastry dough into 6 pieces. Roll out each piece into squares roughly 16cm x 16cm and the thickness of a £1 coin; trim the edges to neaten. – the two sides shouldn’t meet in the middle. Press the pastry down around the cheese with your fingertips. Fold over the left- and right-hand sides of the dough. Again, the sides shouldn’t meet in the middle (you want a square of cheese showing on the top). Press firmly around the outside edges of the dough, then crimp them with the back of a fork. Transfer to the prepared baking trays. 6. 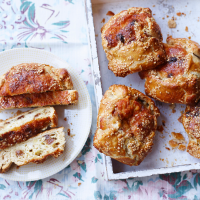 For the glaze, beat together the sesame seeds and egg, then brush all over the flaounes. Bake (in batches if necessary) for 20 minutes, then rotate the trays and reduce the oven temperature to 180 ̊C, gas mark 4, cooking for a further 15-20 minutes, until deep golden. Transfer to a wire rack to cool for 10 minutes before serving, sliced or cut into quarters. The flaounes will keep in an airtight container for up to 5 days (or freeze for up to 1 month).